Swiftair started in 1986, with one single aircraft, and is now one of the leading airlines in the cargo transport sector that operates worldwide and has a fleet of 47 aircraft. How did you accomplish this? We came a long way, and the road wasn’t free of obstacles. Courage, hard work, perseverance and an excellent team, those are the keys to our success. We started operating the aircrafts owned by our customers, which limited our ability to expand our market. So at some point, we decided to reinvest the company’s earnings in the acquisition of our own fleet and by doing so we could increase our customer base. We have arrived where we are today through great effort, searching new customers, studying market conditions and operate in areas where others would not go. For example, Swiftair was the first Spanish airline certified to work for the United Nations. After 30 years of history, what would you say are the main challenges that Swiftair had to face during this time? One of the most important challenges the company had to face, was when we had to adapt to the new environmental conditions imposed by the European authorities, in terms of noise pollution. At the time we had to ground our main fleet in Europe, the B727, due to the noise restrictions during night operations, which meant a reduction of 50% of the company’s revenues. We managed to adapt however and succeeded in redeploying the fleet in other areas of the world (Africa/Middle East) where such restrictions did not exist, discovering new destinations & business opportunities. Another achievement worth mentioning is that we currently are one of the mayor European operators of the ATR’s, as a results of our strategy to obtain a fleet that allows us to respond to a variety of requirements from our customer base. For example, with the latest incorporation of the B737 fleet, we are able to offer our customers a flexible service, to transport cargo from a range of payloads that start with 2000 kgs (Metroliner) up to 20 tons (B737). Finally, we have developed our own cargo system for the ATR fleet, which allows us to convert a passenger aircraft into a freighter in a very limited period of time. Actually there are almost fifty airlines operating in our country, and more than a few of them, were founded in last couple of years. What makes Swiftair different from these companies? For us, the most important thing is to provide a quality service and these, measured by 2 main indicators, regularity & on time performance, are currently above 99%. The daily battle to achieve these high percentages are part of our ongoing commitment to our customers. This implies addressing our business from a different perspective, one that puts the customer always first, in order to avoid a service disruption. Even if this means that we have to send an aircraft, at our own costs, empty from Palma to Hannover to recuperate the line. At the moment, this is what differentiates ourselves from the competition and what our customers value the most. We continue to work with the same spirit and humidly from the early days of the company, keeping a close eye on the market which allows us to continue to offer a good service to our customers. A question which has to be asked; digitalization is affecting all sectors, whatever they may be, how is this affecting Swiftair & the aviation market in general? Digitalization of the aircraft results in a fuel saving & reduction of the contamination levels, hence good for the environment as well as for Swiftair. We are at this point implementing a digitalization plan in phases. Two years ago, we implemented a scheduling & certification system which saves paper. Aside from this, we developed our own program to follow up on Co2 emissions which allows us to digitalize a lot of our processes. On operational level, we have been certified to use an EFB (Electronic Flight Bag) which allowed us to eliminate all related paperwork in the cockpit. Each pilot has a tablet with all documents required, including maps. In a second phase, we expect to digitalize all manuals & related documents used by the maintenance teams. Nevertheless, note that we are limited to the civil aviation regulations, whom determine the pace of implementation of these enhancements in our sector. It took them various years to introduce the digitalization of the maps, and we don’t know what will be their next step. Looking at the future, what are the projects that Swiftair has in mind for the coming years? For the future, whereas the fleet is concerned, we are going to renew the fleet with more modern & less contaminating equipment. The renewal of the fleet is an ongoing commitment. Swiftair is not a static company, but one that adapts and is in constant movement. Moreover, en coming years, we will inaugurate a maintenance hangar where we will perform our own base maintenance activities, something that till now was subcontracted to companies situated outside Spanish territory. This project, that started some 12 years ago and will be finished in 2020, will result in the creation of numerous jobs, accompanied with a restructuring of the company. What challenges lay ahead for the sector? One of the main challenges of our sector (regional air cargo transport) is related to an obvious problem. The low utilization of the aircraft. While passenger aircraft, which operate over and above an average of 8 hours per day, a regional cargo aircraft will do 4 times less, as it is only used at night & remains parked during the rest of the day. The final objective is to be ever faster and more efficient in order to respond to the final customers needs. Swiftair nació en 1986, con solo un avión, y ahora es una aerolínea líder en el sector del transporte de carga que opera a nivel mundial y posee 47 aviones. ¿Cómo lo han conseguido? El camino ha sido largo, y no exento de obstáculos. La audacia, el trabajo duro, la perseverancia y un excelente equipo humano, han sido las claves de nuestro éxito. Empezamos operándolos aviones de nuestros clientes lo que limitaba ampliar nuestro mercado. En un momento dado, decidimos reinvertir los beneficios de Swiftair en la adquisición de nuestra propia flota de aviones y así poder ampliar nuestra base de clientes. Hemos llegado hasta aquí con mucho esfuerzo, buscando nuevos clientes, estudiando el mercado y consiguiendo volar donde no lo estaba haciendo nadie. Por ejemplo, hemos sido el primer operador aéreo español homologado para trabajar para las Naciones Unidas. Después de estos más de 30 años de historia, ¿Cuáles diría usted que han sido los grandes retos a los que se ha enfrentado Swiftair? Uno de los retos más importantes, a los que se ha enfrentado la compañía, fue cuando nos tuvimos que adaptar a las nuevas condiciones medioambientales impuestas por Europa, en términos de contaminación acústica. En ese momento nuestra flota más importante, los B727, tuvieron que dejar de operar en Europa debido a las limitaciones operativas nocturnas, lo cual suponía la pérdida del 50% de la facturación de la compañía. Ante esta situación, supimos adaptarnos buscando otros mercados (África/Medio Oriente) en los que no aplicasen dicha restricción y, descubriendo así, nuevos destinos y oportunidades de negocio. Otro hito destacable ha sido llegar a ser uno de los mayores operadores de Europa de la flota de ATR como consecuencia del estudio realizado para disponer de una flota que permitiese mejorar la capacidad de respuesta y satisfacer las demandas de nuestros clientes. Ahora, por ejemplo, con la última incorporación de la flota 737, somos capaces de ofrecer un servicio de transporte flexible dentro de un rango que va desde 2000 kgs (Metroliner) hasta las 20 toneladas (Boeing 737). Por último, hemos sido capaces de desarrollar nuestro propio sistema de carga del ATR, lo que nos permite convertir un avión de pasaje en carguero en un tiempo muy reducido. En la actualidad hay casi medio centenar de aerolíneas operando en nuestro país y, muchas de ellas, han sido fundadas en los últimos años. ¿Qué es lo que diferencia a Swiftair de su competencia? Para nosotros, lo más importante es la calidad del servicio y para asegurarlo, trabajamos con dos indicadores, regularity y on time performance, los cuales actualmente están por encima de un 99%. La lucha por mantener estos porcentajes responde a nuestro compromiso con el cliente y para brindar el mejor servicio posible. Esto supone afrontar el negocio desde otra perspectiva, una que suponga anteponer al cliente y, en ciertos momentos, asumir costes para asegurar que el avión salga y el servicio no se interrumpa, aunque tengamos que mandar un avión en vacío de Palma a Hanover para recuperar una línea. Hoy en día, esto es lo que nos diferencia de la competencia y lo que más valoran nuestros clientes. Seguimos trabajando con la misma humildad y espíritu desde del inicio de la compañía, estudiando continuamente el negocio, lo que nos permite ofrecer una excelente atención a nuestros clientes. Una pregunta obligada: la digitalización está afectando a todos los sectores, da igual cual sean, ¿cómo está afectando a Swiftair y al mercado? La digitalización de los aviones supone un ahorro de combustible y reducir los niveles de contaminación, por lo que es positivo tanto para el medio ambiente como para Swiftair. Nosotros estamos implementando un plan de digitalización por etapas. Hace dos años, implantamos un sistema de programaciones y certificaciones que ahorran papel. Además, a nivel de gestión interna de la compañía, para el control de personal o de emisiones de CO2, hemos desarrollado un programa propio que nos permite digitalizar muchos de los procesos. A nivel operaciones, estamos certificados EFB (electronic flight bag), ya que hemos eliminado todo el papel en cabina. Cada piloto lleva una tablet con toda la documentación de abordo incluida la cartografía. En una segunda etapa de implementación, esperamos digitalizar todos los manuales y documentación que utilizan los equipos de mantenimiento. Sin embargo, estamos limitados por la normativa de aviación civil, que es quien marca los cambios del sector. Han tardado varios años en implementar la digitalización en términos de cartografía, y no sabemos cuál será el próximo paso. Mirando hacia el futuro, ¿Cuáles son los proyectos de Swiftair para los próximos años? Swiftair es una compañía con vocación de consolidación y de futuro. No está enfocada en volumen, sino en calidad y en encontrar nuevas oportunidades. Es por esto que nuestros objetivos no se definen en grandes números ni en contratos internacionales, sino en superarnos a nosotros mismos. A futuro, en cuanto a flota se refiere, la iremos renovando con aviones más modernos y cuya huella ecológica sea menor. La renovación de la flota es una apuesta continua. 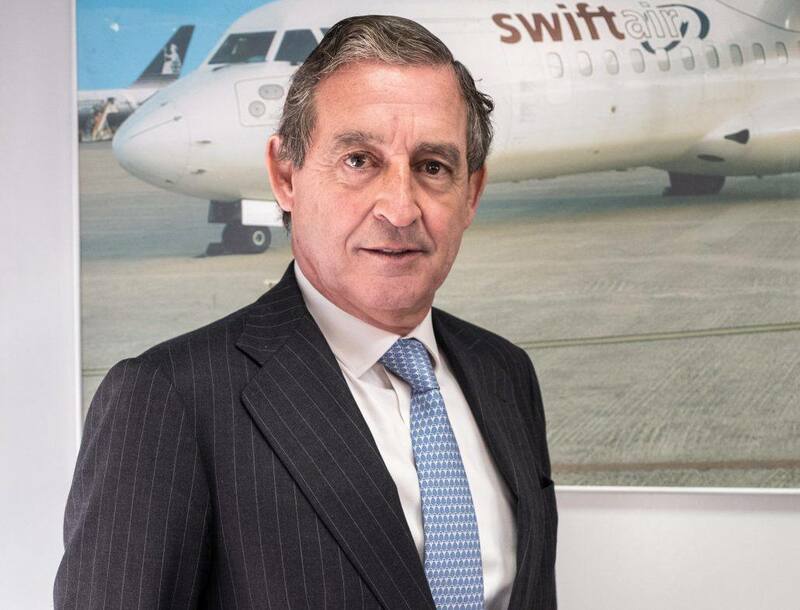 Swiftair no es una compañía estática, sino que está en continuo movimiento y en continua adaptación. Además, en los próximos años, inauguraremos un hangar donde podremos realizar todas las labores de mantenimiento que, hasta la fecha, las estábamos haciendo con empresas externas y fuera de España. Este proyecto, que empezaba hace 12 años, verá la luz en 2020 y supondrá de la creación de un número importante de nuevos puestos de trabajo y una reestructuración de la compañía. ¿Qué retos presenta el sector? Uno de los retos de nuestro sector (transporte de carga regional) responde a una problemática muy evidente, la utilización de los aviones es muy bajo. Frente a los aviones de pasaje, que vuelan una media superior a las 8 horas diarios, un carguero lo hace 4 veces menos, porque operan únicamente por la noche y el resto del día están parados. El objetivo final es conseguir ser cada vez más rápido y más eficiente para responder a las demandas de los clientes finales.